I wasn't ready for this interview. I wasn't ready to bump into Ivan Abadzhiev himself in the dark section of the Peace and Friendship stadium in Athens. But it happened. At the moment when the greatest coach was opening the door to the training hall that journalists are not allowed to enter, I decided to call his name: "Ivan!" Abadzhiev stopped and looked at me. - Wait! I would like to introduce myself. And if you don't mind, I would like to take an interview with you. - I think there are not too many coaches of your caliber in the world. And, unfortunately, not too many new names were added in the recent years. Too tough of a business. - What can you possibly know about it? - My father was a head coach of the Soviet national swimming team. But you probably don't know him. The coach grabbed my accreditation card and flipped it to read my name. - Is Sergey Vaytsekhovsky your father? Of course, I heard of him. - Stop by the hotel. I am there up till the lunch time. Our lifters don't compete in the B groups. Abadzhiev became the head coach of the national Team Bulgaria purely by accident. He dreamed about a career of an artist. But too many things happened to him by accident. It was an accident that he came to the gym as a gymnast. Then he switched to weightlifting. In 1953, he terrified his coaches when he began to train twice a day. He won a silver medal at the world championship and he was the first Bulgarian weightlifter to be awarded with the title of the Merited Master of Sports. Then he became a sports functioneer. He pushed papers and pencils in the sports committee and once in a while spoke up about the stupid training methods of the national Bulgarian team. In 1968, Bulgaria flopped at the Olympics and the sports leaders overheard one of the loud comments of "mad man" Abadzhiev. "Who is he? Smart guy, huh? Let him take the national team and let's see what he can do... We have nothing to loose anyway!" At the 1972 Olympics in Munich, Bulgarian lifters won three gold and three silver medals. - Theoretically, we expected just two silver medals, - remembered the coach. - But it's only theoretically. As a matter of fact, our featherweight hopeful was Norair Nurikyan, my student and I prayed to God that he will make it to the top 6. There were at least six equally strong lifters in his class. Dito Shanidze was an obvious leader. But we got lucky. Nurikyan showed an unexpectedly good result in the first lift type and he got a chance to compete for the second place. I was already pleased. Before that, Bulgaria had no medals at the Olympics. I knew that Shanidze would start clean-and-jerk with 147.5 kilos. Then he will lift 152 and then he will try 155. This will make him an Olympic champion for sure. I made only one mistake in my predictions. Shanidze failed with lifting 155 kilos. - You know... The coach is never positive 100 percent if his lifter will win or not, - continues Abadzhiev. - Sometimes, it's enough to catch an eye of your opponent and to loose confidence in yourself. At the Olympics, it's the end of the story. But I saw Nurikyan going to the platform without any sign of a doubt on his face. There was this deputy of our sports committee sitting next to me. He turned to me and whispered loudly: "Will he be able to lift it?" I was ready to kill him. "Are you crazy? Of course, he won't be able to lift it!" While we were arguing, Nurikyan got it. David Rigert was a middle heavyweight favorite. In those times, he was winning over his Bulgarian opponents by 10-15 kilos in each lift. So, I wasn't worried. Andon Nikolov was supposed to get the silver or bronze medal anyway. And all of a sudden, our team doctor came to our room and told us: "Rigert bombed out!" At the moment, I felt really bad for David. He was supposed to win. I guessed that he wanted to win with a big advantage and started with a too big of a weight. - How many years have you been working with the national team? - Since 1969. 30 years. I would have retired long time ago. I wanted to do it many times. But I can't afford it. I won't be able to support my family. Although, many Bulgarians think I am a millionaire. Abadzhiev became a legend in the world of Olympic weightlifting. Bulgaria that was never especially distinguished in sports began to challenge the Soviet Union. And it happened in the sports of weightlifting. At the 1976 Olympics, Abadzhiev's team won two gold, three silver and one bronze medal. Four years later, they brought two golds, four silvers and two bronzes from Moscow. There were different interpretations. Some said that Bulgarian training methods didn't make any sense - no diversity in training, no basic training, no conditioning. Only weightlifting. Maximum weights to be lifted in the training. Someone came up with the saying: "Had Paganini instead of playing violin 15 hours a day played also a flute, he would have never become the greatest." There were talks about Bulgarian lifters using banned anabolic substances. Although, everybody knew that the Soviets were following the pharmacological prescriptions with the same extend. The real panic came in 1984 when all Eastern Bloc countries followed the USSR's boycott of the Olympics in Los Angeles and went on with the alternative Friendship Cup. Bulgarians won in six weight classes, the Soviet Union in four classes. After that Abadzhiev was told to resign by the Bulgarian sports committee. The coach refused. - I said "Why? Because we won over the USSR?" I knew the answer anyway. I heard the conversation between the IWF General Secretary and our sports deputy. It was about that it's not good that two countries are so far ahead of the other countries. It slows down the progress of the Olympic weightlifting overall. Of course, the actual meaning was that the USSR is a big and powerful country and it's acceptable that they are so far ahead in sports. But it wasn't allowed for some Bulgaria. 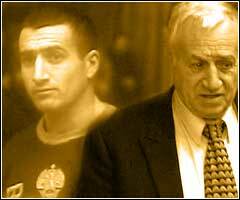 Everybody knew that when Bulgarians beat the Russians, it was beyond the sports and it had a political context. I realized quiet clearly that the main goal that the Soviet weightlifting authorities had wasn't the World and European championships but to win over Bulgaria. But we kept winning. In that conversation with the General Secretary, he asked me: "Is it OK that only one country keeps winning?" Of course, I said: "It's not OK" He jumped and even began to kiss me. Four years later, before the Olympics in Seoul, Abadzhiev was approached by one of the top sports officials in Bulgaria. "That's it. You can only win two gold medals. If you win three, they will chop your head off. And mine too." - I knew alot about the Soviet lifters' training, - says Abadzhiev. - I knew that they were not as well prepared as we were. Of course, your experts knew what was going on in our team. With all these said, the IWF was helping the Russians. No one helped us. But even I couldn't understand why your officials predicted five gold medals for the Russian team. - For the whole world, the Olympics in Seoul were associated with the weightlifting scandal. Bulgarian lifters were disqualified and the whole team left for Bulgaria before the end of the competitions. - It was a very strange story. In Bulgaria as well as in the USSR, we had local doping control tests before competitions. We made over 50 tests. And despite this, they began to catch our lifters with the furocemide. It belongs to the diuretics. At that time we studied how it worked. We did research how it shows in test results by hours. It was practically impossible to detect it 72 hours after you took it. However, according to the Seoul tests we had a monster load detected via those tests. Needless to say that positive tests were shown in the weight classes where we were competing against the Soviet athletes. For example, Mitko Grablev was disqualified and Oxen Mirzoyan got the gold medal. After Angel Genchev tested positive, Israel Militosyan got the first place. And their lifters were weaker. And in the classes where the Soviet lifters didn't compete, Bulgarian tests were clean. When the scandal just started to take place, we decided to set up a meeting with the Soviet delegation. We met in the park - we were afraid of microphones and that someone will tape the conversation. Bulgarian chairman asked Marat Gramov to help and to do the tests of Bulgarians in the Russian lab. They lied to us. They said there was no Soviet lab there. It was there. It was on the boat. I knew it for sure. - You are Russian, right? - Abadzhiev paused for a moment. - It's not very good that I tell you all this. But it's the truth. You know I love Russia. You can see I am fluent in Russian. I admire Russian painters - Repin, Surikov, Kramskoy, Polenov, Vasiliev, Shishkin, Ayvazovsky, Levitan, Serov, Vasnetsov... I think I know more Russian songs than you do. Your singers are not as well known as the ones from the Western Europe but they were outstanding. By the way, we brought Lemeshev's recording with to Athens. I love to listen to Vinogradov. He sang in the war and post-war times... As for the weightlifting, it's a different story. - Did you leave the national team Bulgaria after the Olympics in Seoul? - No. I worked for one more year. We changed the whole team. I put together a very young team and we won again. Then they kicked me out. Right after the European Championship. ... He came back to Bulgaria where no one wanted to see him. During the 20 years of coaching, he prepared 9 Olympic champions, 57 world champions, 64 European champions and he couldn't find a coaching job even in the peripheral sports clubs. He tried to coach abroad but the foreign federations politely refused with "we can't afford to pay to a coach of such a high qualification". His phone at home got quiet. He had two children and a wife who left her job. Desperate Abadzhiev landed a security guard job in a kindergarten. Then he worked for a firm manufacturing metal doors for the apartments. A few years later, at the 1993 European Championship in Sofia, Abadzhiev decided to attend the competition. No one talked to him there. And then the fortune turned nice to Abadzhiev. He became a coach of a badminton team. Two years later, on December 15, 1995, he got an invitation from Turkey where his favorite student Naum Shalamanov defected two years before the Seoul Olympics. In Turkey, the lifter got a new name Naim Suleymanoglu, won two Olympics, was considered the main contender for the third one in Atlanta and... desperately needed a coach. In Atlanta, Suleymanoglu won his third gold Olympic medal. Halil Mutlu also became a champion. It was two gold medals versus one silver and two bronze medals of Bulgaria. "What did you want the most at the time?" I asked Abadzhiev in Athens. "I wanted to win over Bulgaria. Least of all I expected that they will offer me to come back and that I will not turn the offer down. - I was mad at them. I could have left Bulgaria long before the Seoul. But I couldn't even think about it. I thought that my methodology was our national treasure. That's why I kept it in secret for so many years. - Not now. Too many Bulgarian coaches and lifters are working all over the world. And then it's too late. Though when I just started to work on it, they called me a mad man. - Because of your methodology? - It wasn't like any other system in the world. It contradicted every basic principles. In Bulgaria, many other sports disciplines are build on the methods developed by the Soviet experts. The main concept is distinct periodization, preparation stage, interim stage, competition stage... I threw it away at once. When a rabbit is being chased by the wolf, does he have an interim stage for running? Yes, he can hide in the bushes but he is ready to start running 100 percent at any time. Is it logical to achieve outstanding results by hard work and then to stop and to go back to a lower level? I began to think about it and then I saw a very interesting research study of Swedish scientists. You know each muscle consists of various textures. The fast ones - the ones that the lifters need the most, and the slow ones. Under certain training intensity, the slow ones can turn into the fast ones and the other way around. The first process requires a long-term work and high intensity, the latest happens instantly... just decrease the intensity. That's what happens in the interim stage. - But it's very hard to train with a constant high intensity and stress. - And how about the adaptation theory? It's a science by the way: if you place a body into a certain environment, it begins to adapt to it. - Professional sport is a tough activity overall. - But Olympic weightlifting is not the sport where competitions go one after another one. I know that the Russian lifters have three to four competitions per year. - I tried to set up as many competitions for my lifters as I could. Even in the old times, when our team was definitely the best in the world, we had nine to ten competitions per season. The first one was always the national championship. We mixed the big sports competitions with the commercial ones. So, the lifters had a better motivation. - Do you have any dreams as a coach? - I don't have dreams anymore. I stopped to enjoy competitions. I think there is a limit for neurological reserves. My heart hurt. I am tired of arguing with young coaches who at first don't want to listen and then couldn't understand why they underachieve in the results. Besides, I am not sure if I can achieve more than what I already did. For example, there won't be a lifter able to make a three-bodyweight lift. Shalamanov whose bodyweight was less than 60 kilo could do it. He cleaned 202 kilos. It was over 10 years ago. I was very proud of him. It's very different in Bulgaria now. We had to sell the whole team to Qatar in order to finance the one that was left. And I am still not happy with the world championship results. We have a world champion - Galabin Boevsky. He won both lifts, set world records in total and clean-and-jerk. But in training he lifted much more. Two month before the championship, he relatively easy cleaned-and-jerked 205 kilos. - Do you think that the lifters should always lift their maximum weights on the platform? - It's a good question. On the one hand, I don't like heroics - it's just too easy to get an injury. Boevsky simply didn't lift what he was ready for. Many people blame me that I overload lifters in the training. 15-20 kilos more than needed for the win. They say that it's enough to lift 2.5 kilos more than your opponent does and you are a champion. What is 2.5 kilos? Nothing. You get a light cold before the competition or a small injury and that's all. Someone else will win. Even if you win, 2.5-5 kilos doesn't give you any psychological advantage. But I am tired to argue. After Sydney, I'll quit the weightlifting. - That's it. I am very old. I don't think I will live much longer. - I used to know one old lady who all her life, up to when she turned 105, lived in a small village, had a small farm and a cow. And then decided that she is too old for early morning wake-up, farm work. She gave her cow to the neighbors. And then she died in a few months. - When a person stops to work intensively - whatever he's doing - his body looses it. He gets ill. But... I'll think about it. Maybe I will keep my cow for a while. Videos and Gallery of Ivan Abadzhiev is available in his section of the Hall of Fame @ Lift Up.